The Pressure Cooker has evolved since its earlier form made of cast metal, which was invented by the French Scientist Denis Papin in 1689. He publicized it as “A New Digester or Engine, for softening bones, the description of its makes and use in cookery, voyages at sea, confectionary, making of drinks, chemistry, and dying, etc.” Although he had thought it could be helpful for the poor to obtain squeeze out nutrition from bones, the dearness of the earlier models made it a failure. The later versions, especially Alfred VischerFlex-Seal Speed Cooker in 1930s, gained prominence and slowly the cookware started making its hold in ordinary kitchens. In India it was first manufactured in 1959. Gradually Manufacturers came up with the better versions of Pressure Cooker and its contemporary style is something that can be efficiently operated without any hassle. Maximum people might be aware of the simple physics which make a Pressure Cooker work, but they might not relate it when it is applied in the kitchen. Now, before discussing the detailed mechanism of Pressure Cooking, we must know the built of the same. It is a known fact that water boils at 100 degree Celsius (or 212 degree Fahrenheit) after which water starts producing steam, its gaseous state. If we allow more heat to be exerted on an open vessel, the temperature shall remain same while the intensity, with which the steam is produced, will increase. Now it is here, that the pressure cooker, which is a sealed vessel, differs from the conventional cooking vessels.It seals the steam inside, due to which the pressure inside the pot increases and the liquid is pushed to give rise to the boiling temperature. The temperature in a Pressure Cooker may rise up to 121 degree Celsius (or around 250 degree Fahrenheit) in a Pressure Cooker. The Pressure Regulator on the lid is indicates the required pressure level. The pressure can be maintained by adjusting or lowering the heat source, since excess pressure gets vented out. Thus Pressure Cooker does nothing more than creating steam pressure with which raw food is cooked easily. The modern day Pressure Cookers are far more advanced and come loaded with many convenient and safety features, which makes cooking, a smooth experience. When you are running for office, helping your kids to get ready for school, it becomes difficult for you to cook. Obviously you won’t be able to compromise with your health either. To cook fast and to cook healthy only pressure cooker can be your best friend. It cooks in a few minutes. Since the like remains close, there are low chances of losing the nutrients through steam. It also helps to retain the actual taste of the food. In today’s fast paced life, it is necessary to spend as less time as possible in kitchen. To do that pressure cooker will help you a lot. 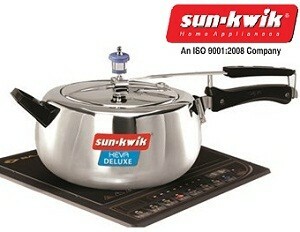 Especially after invention of induction ovens, pressure cooker has become more essential. While you are going to buy some pressure cooker product you need to know how many types of cooker are available in the market. If we go by material then there are two types of pressure cooker. 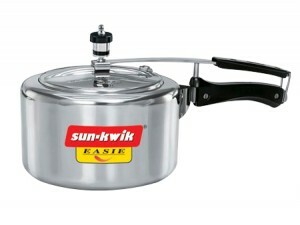 Aluminium pressure cookers are easily available in the market. They are less expensive too. However, they are not sturdy. Since a cooker has to handle extreme heat, aluminium cookers are never a good idea. They easily become affected by the heat. So, it is never suggested to buy an aluminium pressure cooker. Stainless steel is a sturdy material. It can withstand extreme, heat and rough handling. 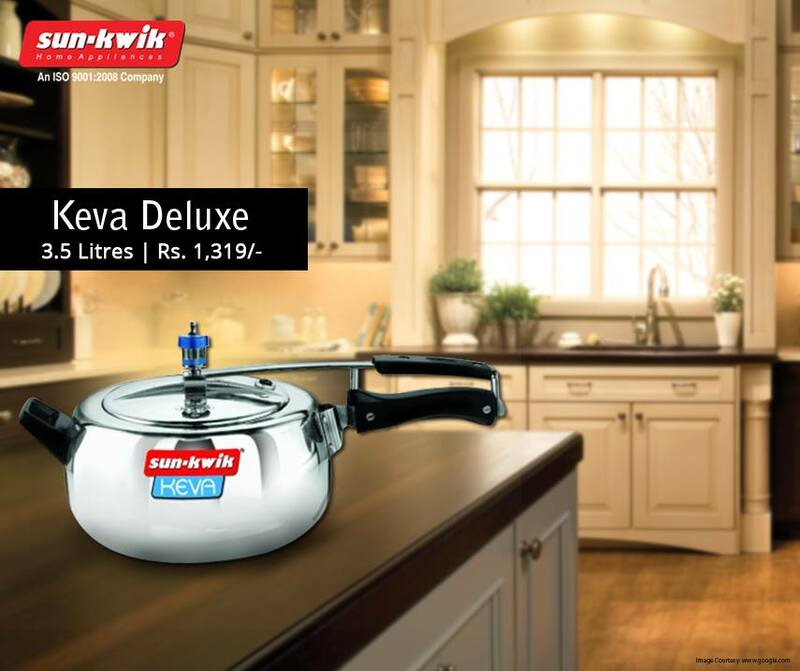 Go for stainless steel pressure cooker when you are going to shop for pressure cooker. It is expensive but the price is worth it. 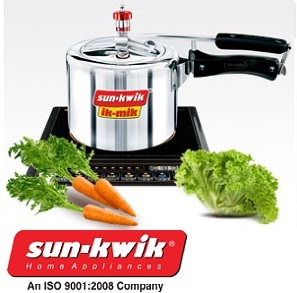 Pressure cooker has gone through a lot of stages of development and improvement since its inception. There are three generation of pressure cooker. These traditional type pressure cookers work only in one pressure mode. These cookers operate on technique of weight bearing valve. The usage option of this cooker is limited and it is noisy. These cookers have spring loaded valves and it helps to increase or decrease the pressure. These new generation pressure cookers are electric and equipped with programmed microchips. It records and reviews many data while food is cooking inside the cooker. Know your own requirements and choose the right pressure cooker for you. When you are running around to keep up with the fast pace of life and thinking how to strike balance between work and nutrition it becomes quite a struggle. But when you have the utility utensil like pressure cooker in your kitchen you have nothing to worry about. Probably there is some distant memory of a bursting pressure cooker and the splattered food everywhere doesn’t let you use it frequently but I will tell you it is safer now. Pressure cooker manufacturers are coming up with the products that are safe to use and does not cause accidents. Now, if you are thinking about what benefits you can get from using a pressure cooker, take a look at the following benefits. You will be amazed. As while cooking in a pressure cooker you are cooking in an enclosed pot it becomes easier to retain the taste and the nutrients. I an open stove top pan most of the nutrients and taste gets evaporated with the steam. But in the case of pressure cooking as steam remains trapped in the food could retain most of the nutrients and taste. As the food gets cooked in the enclosed space of pressure cooker, the heat remains trapped in the cooker itself. As a result, it quickens the cooking procedure a lot. It also results in saving a lot of energy too as cooking is happening in a fast pace. The pressure cooker doesn’t let the juices to spill on the kitchen counter top. It also lets your kitchen remain cool as the heat remains inside the pot only. Invest in pressure cooker products and make cooking an easy breezy affair.